If Mr. Wasiu Olaitan had kept his tradition of not going out to work on Thursdays, perhaps he would have been in the comfort of his home today – hale and hearty. A 41-year-old commercial bus driver, who augments his daily income by operating as a vulcaniser by the side, the father of three invests much of his energy and time into productive activities that would help put food on the table for his family. Abandoning his native Ile-Ife, an ancient town in Osun State boasting of a rich culture and tradition, several years ago in favour of Lagos where his search for a better life has continued, Alawasi, as he is fondly called by those close to him, has not really had it easy over time. Though managing to build a small house in the Ibafo area of Ogun State to shelter his family, the middle-aged man has continued to contend with all manner of struggles in his quest for a major breakthrough in life. “I saw darkness everywhere immediately the tanker exploded,” he said while speaking with Saturday PUNCH on Friday on his hospital bed where yards of bandages now strapped him like an armour. “I thought I was going to die. It was as if the end had come. There was commotion everywhere, just like in a war. Nothing else came to my mind. We all believed it was the end,” he added soberly as he narrated his ordeal to his teary-eyed wife – Faidat – and other family members, who had come to check on him on Friday morning. 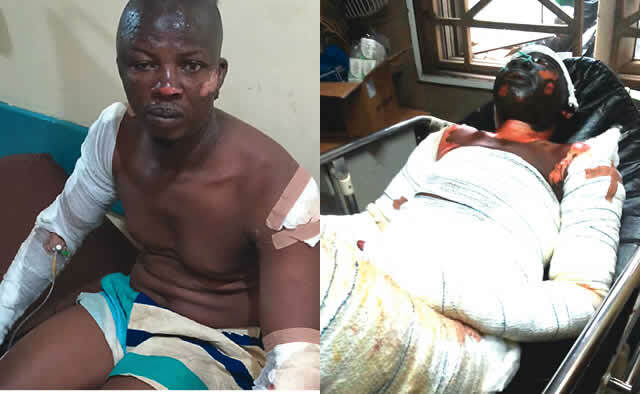 One of our correspondents, who was at the Trauma and Burns wing of the Gbagada General Hospital where he and a handful other victims of the tragedy are being treated, went in with the party after posing to security men as his relative. Revealing how the tragedy and her husband’s present condition had affected their life as a family, Faidat told Saturday PUNCH that things had not remained the same since Thursday. According to her, they had expended almost all the money on them in trying to save his life.